LONDON, England (CNN) -- Sky News, the British-based 24-hour news broadcaster, will not show a controversial appeal for aid for the people of Gaza, it announced Monday. Protesters demonstrate in London Sunday against the BBC's decision not to show Gaza aid appeal. Sky News joins the BBC in refusing to show the appeal by the Disasters Emergency Committee, an umbrella group of 13 leading British aid agencies. The BBC, Britain's public broadcaster, has been criticized by politicians and religious leaders for refusing to show the appeal, which launches Monday. There have been demonstrations against the decision at BBC buildings in England and Scotland. "Broadcasting an appeal for Gaza at this time is incompatible with our role in providing balanced and objective reporting of this continuing situation to our audiences in the UK and around the world," John Ryley, the head of Sky News, said Monday in a statement on the company's Web site. The Disasters Emergency Committee (DEC) includes the British Red Cross, Oxfam, Save the Children and 10 other charities. British broadcasters, led by the BBC, originally declined to air the Gaza appeal, but in the face of criticism from government ministers and others, ITV, Channel 4 and Channel 5 changed their minds. CNN was not approached to broadcast the ad, a DEC spokesman said. About 5,000 people demonstrated in front of the BBC's Broadcasting House in central London on Saturday over the broadcaster's stance. Seven people were arrested. About 50 people protested at its Glasgow headquarters Sunday. The corporation received about 1,000 phone calls and 10,000 e-mails of complaint in the three days after it announced its decision Thursday. But the BBC is sticking with its position, director general Mark Thompson wrote in a blog post on the corporation's Web site. "Inevitably an appeal would use pictures which are the same or similar to those we would be using in our news programs but would do so with the objective of encouraging public donations. The danger for the BBC is that this could be interpreted as taking a political stance on an ongoing story," he wrote. The BBC, which is funded by an obligatory license fee paid by every British household with a television, is required by its charter to be impartial. 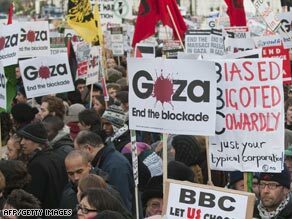 The DEC is "disappointed that the BBC declined to support the Gaza appeal," a spokesman told CNN. "It might limit the reach of our key message to the general public." Many readers of Thompson's blog post did have a view, however. The statement received hundreds of comments, most of them critical of the BBC. A commenter who signed in as bully--baiter said the BBC was taking a side no matter what it did. "I think the reasons for blocking help for a grave humanitarian disaster are simply astounding," brit--proud wrote. "How can simply bringing food, medicines and homes to hundreds of thousands of innocent civilians be seen as political impartiality? How stupid do the BBC think the British public are?" The corporation had its defenders as well. "The last thing I want to do, is fund the BBC to broadcast propaganda," SternG wrote: "There's no way I will pay the BBC to air the DEC's politically-motivated 'appeal' for Gaza. Gaza is run by a government which is internationally recognized as a terrorist group, including by the EU. There is no doubt that some aid/fund will be 'procured' by Hamas.... Good decision BBC."